Are you still with me? It’s time to talk about baby step 2. To begin, you’ll want to list your debts smallest to largest. This includes all debt. Even if you owe it to your grandma. Ok, did you do that? Now you need to create your budget! Make a column for each payday, and then start listing things you need to pay out of that check. Make sure you include things like groceries and gas, and spending money. These areas will take the most adjusting at first. Because a lot of times we don’t realize how much we actually need for these categories. Now if you have money left after everything is written down, send all that extra money to your smallest debt. This is called a zero-based budget. There are 0 dollars left. You told every dollar what to do. Envelopes. Get some envelopes. Now drive to the bank (please don’t drive to the bank while reading this). Write on the front of your first envelope, GAS. 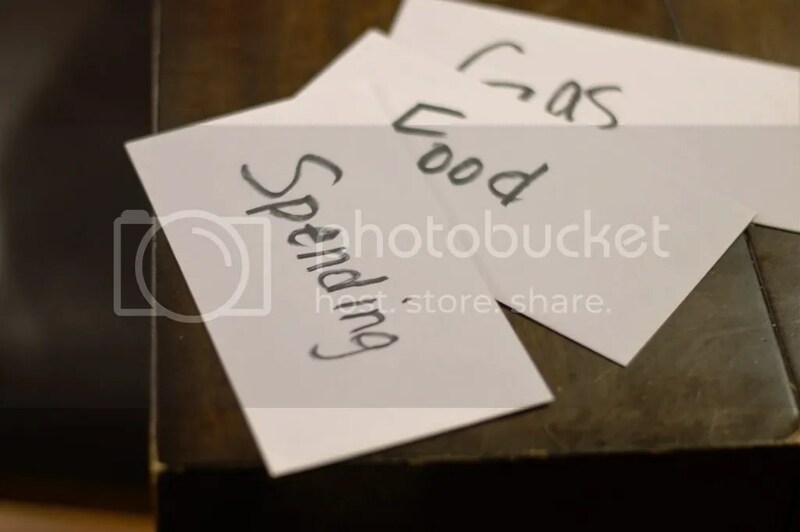 Fill the envelope with your allotted gas money for that week. Then on envelope 2, write FOOD. Fill this envelope with the money you plan to spend on food for this week. The same goes for spending, or anything else you can pay with cash. Dave actually recommends you pay everything this way. We pay all our bills online, and then draw out the rest and fill our envelopes. It does take time to get used to, but it really helps you stick to your budget. Sometimes it is just too easy to swipe your card when you want to buy something, but when the cash is gone, it’s gone. So overspending isn’t an option. Swiper, noooo swiping!!! Baby step 2 isn’t over until all the debts on your list are paid in full. During this time you are making minimum payments to everything on the list, and paying extra to the smallest debt. Once it is paid in full, your debt snowball (the money you are paying towards debt) just grew! You now have that original amount plus whatever your minimum payment on the first debt was. Now take that and apply it to the next thing on your list. Dave recommends that this process should be completed within 2 years. If you calculate it out and it doesn’t look possible, it may be time to sell. For example, Dave recommends that all the things you own, that have a motor in them, when combined, should not exceed 50% of your annual income. This is because cars depreciate! Quickly! But cars aren’t the only things you can sell to get your snowball rolling. Look around the house, what items do you have that you don’t need? Maybe you could have a yard sale! The other thing that could hold you back is your house payment. Your house payment should be approximately 25% of your take home pay, or less. If your payment is higher, it could hold you back from effectively getting out of debt, or saving in the future. If that is the case, your options would be to increase your income, or sell the house and get more affordable living accommodations. This is a hard step, but it is the most important. It isn’t possible to save money, if all of it is going out in payments and interest. Once the debt is gone, you can get serious about saving, and change your family tree! Do you have questions? Email me or message me on Facebook! Hit the plus sign in the lower right corner to below to be notified when the next post in this series is published. Happy saving! Ok, just got my tax refund…completed baby steps 1 and 2…bring on #3!! !